You can use ready-rolled pastry sheets for this, but for an authentically rich and buttery effect you should make your own. Served with a crisp salad on the side, onion tart makes a meal, though traditionally in Alsace, it precedes choucroute – the pickled cabbage cooked in goose fat with sausages. Sift the flour with a good pinch of salt into a food processor and whiz in the butter. Add the beaten egg and just enough iced water to make a dough. Wrap in clingfilm and chill for 30 minutes. Preheat the oven to 180°C/ gas 4. In a heavy-bottomed pan with a lid, sweat the onions and lardons in the butter and sugar with a pinch of salt over a low heat. The onions should not brown, but merely soften – this takes about 30 minutes and you will need to stir occasionally. On a floured board, roll the pastry out thinly. Place in a lightly buttered, 20cm tart tin (ideally one with a removable bottom), prick with a fork and chill for 20 minutes. Line with greaseproof paper, add baking beans and bake in the oven for 10 minutes. Mix the egg yolks with the crème fraîche, nutmeg and some pepper. Take the pastry out of the oven and remove the paper and beans. 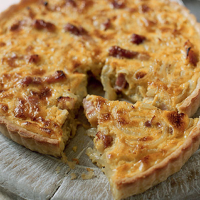 Drain any fat off the onions and lardons, spoon into the pastry case and add the egg mix. Turn the oven up to 190°C/gas 5 and bake for 25–30 minutes. The liveliness of a riesling wiil lift the onion and pastry combination.